Everywhere you look in Costco you’ll find “Kirkland Brand” plastered on everything from paper towels to socks. You name it, there’s a Kirkland Brand version of it, because “Kirkland Brand” is Costco’s private label. 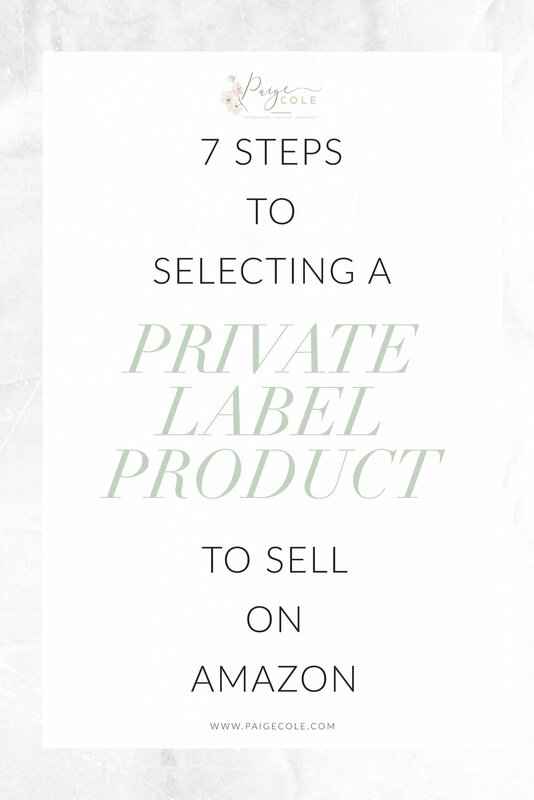 If you’re looking to create a private label of your own on Amazon (and you really should because it’s such a great opportunity) there’s one big step you need to take very seriously - product selection. Follow these seven easy steps for selecting private label products and you’ll be sure to have a successful launch on Amazon. Grab my FREE Product Selection worksheet below. Thank you! Now check your email for your free worksheet. There are two ways to do product research. The first is the free version which is to manually look up products online and take down notes on BSR, revenue, reviews, estimated monthly sales and so on of individual products in a spreadsheet. I personally used this method for way too long, wasting precious time and energy, until I found the second and much more efficient way to conduct product research - using software like Jungle Scout. You can use Jungle Scout as a chrome extension or as a web app. 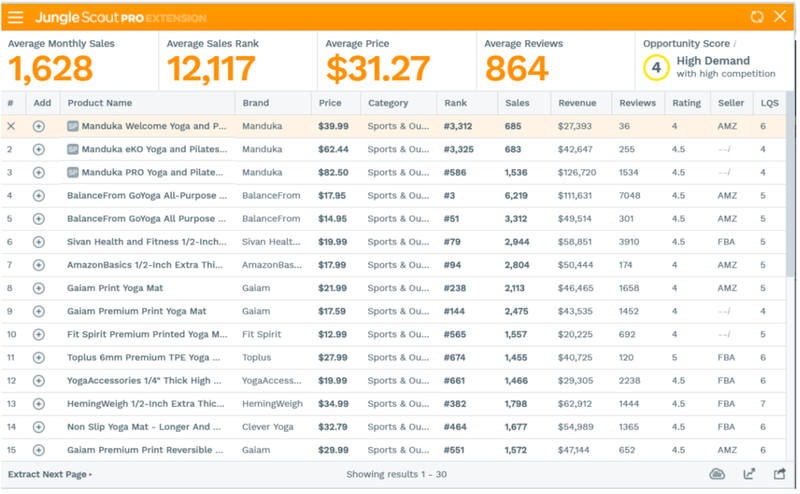 When you use Jungle Scout’s chrome extension on Amazon, it crawls through and analyzes any products on the page and gives you detailed insight on the product. Here’s an example of what comes up in the chrome extension when you search “yoga mat." The web app allows you to input specifications and search multiple products depending on your search criteria. Now, I’ll say this: I am an affiliate for the product, but I highly recommend this because, even though it does cost money, it’s all worth it since it makes running your private label Amazon business a lot smoother. When it comes down to it, selling private label products on Amazon is a business and needs to be treated as such. Meaning, the time you spend working is a precious commodity (including the research). When I put in the hours, I want to work smarter and more efficiently and that’s exactly what Jungle Scout does for me. I wish I would have started off using Jungle Scout in the beginning- But when life hands you lemons, you write a blog post to tell others not make the same mistake when selecting a private label product of their own. If you’re interested in a more in-depth approach to using Jungle Scout for your business, stick around and I’ll share a helpful tutorial in the coming weeks. Amazon separates their product catalog into an array of categories for you to choose from, like pet, baby, home, sports and outdoors, kitchen and tons more. Figure out what your interests are and see if you can niche down your product selection to serve a specific market. There are a few categories on Amazon that are “gated,” meaning additional approval and documentation is required. Some examples of these gated categories include beauty, automotive, grocery, clothing, fine art, major appliances, and more. Since getting into gated categories can be difficult (but certainly doable), it’s best to stick to an ungated category when you’re first starting out. You want to stay in that range because if you price something too low then all the fees associated with selling on Amazon eat away at your profit. The same goes for pricing too high because your inventory cost will go up when you source more expensive products. But, by all means, if you have the capital to do so, take the chance to source higher priced products. You may end up with a higher return on your investment in the end and you might not because pricing is learned through our own mistakes. In the world of Amazon, reviews are the lifeblood of online sales. The more positive reviews and “social proof” listed under your private label Amazon product, the higher your conversion rate will be. Meaning more sales and more money for you, woohoo! When analyzing the reviews of possible products to private label, you want to search for products that are hanging out in the top listings, with a 3 or 4-star review, and 500 reviews or less. Explore the flaws listed in the product reviews and use the feedback to improve upon them with your product. You want the total number of reviews on a product to be less than 500 so that there aren’t any other market leaders or specific brands that dominate the space; you can come in with new products and get a piece of the pie! Every single product on Amazon has what’s called a Best Selling Rank (or BSR), where products are ranked within their categories based on their sales volume. If you scroll down any product page on Amazon you’ll find its BSR listed in the “Product Details” section. When taking BSR into consideration you want to examine the rank in the main category, not its sub category. 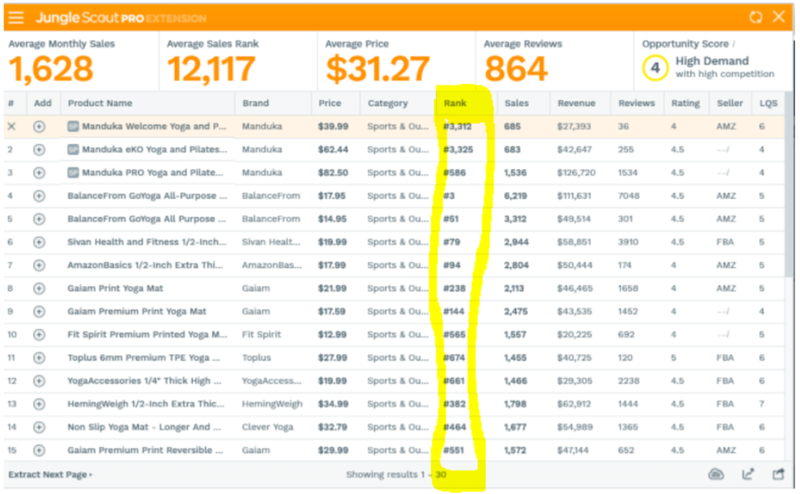 For example, below I’m focusing in Jungle Scout on the product’s ranking within Sports & Outdoors instead of the subcategory of Mats. You want to select a product for your private label that has a BSR range of 500-5,000 in the main category because it shows these products have healthy monthly sales, while not being overly competitive. With your business savvy mind you can get in there and shake things up for the better. Believe me when I tell you that you want to find a product that is under 2 lbs. The lighter the better, because when you’re shipping products it can be expensive- especially when it’s overseas. Did you know that if your product is over the size of 20” L 18” W 14” H. Amazon will charge you extra for oversize storage? Your best bet is to find something small, lightweight, and non-breakable to avoid any issues or additional fees based on size. In the end, it’s about keeping our costs as low as possible and shipping rates for a heavier product can really eat into your profit margin. Do your due diligence before you go through the whole song and dance of sourcing, branding, developing, and listing your product online, by making sure there are no patents currently on the product you’re looking to sell. That means you’ll need to run a patent check and you can do that here. Want to check off all the bells and whistles legally? Hire out your patent research. I work with an excellent gentleman on Fiverr, who charges a $10 search per product for me. That $10 is so little and so worth it in the long run because you’ll spend a heck of a lot more time and money if you select a product that infringes on a patent! Choose a category that serves a specific market, you are passionate about, or you have some pre-existing knowledge in. Try to avoid seasonal products since you want to be making sales year round. Keep an open mind to any product you might find and don’t get attached to any particular product idea. Use the numbers to help you make a decision. Launch one product at a time. Once you’ve mastered one product, you can tackle another. Ready to start the selection process for your private label Amazon product?